It’s a well-known fact that Ian is obsessed with bugs. That’s fine, as it helps with the invertebrate surveys, the biological recording effort and other such important things. But, the revelation has been the appeal of the bug hoover he insists on taking with him everywhere (yes everywhere). 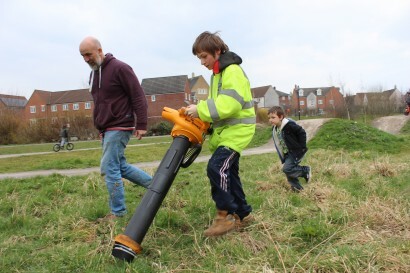 It’s a petrol-driven vacuum sampler, but was christened ‘The Mighty Bug Hoover’ when it made its first public appearance at a school summer fair; since then it’s a star turn pretty much any weekend somewhere on the Island! It’s been quite phenomenal to see kids, and their parents, queuing up to have a go, ages 4 (a little help needed) to 80 (likewise)! It’s a fun bit of noisy smelly machinery for sure, beloved by boys and girls alike, but the wonderful thing is that the ‘reveal’, the emptying of the bug-haul from some verge or hedge or playing field, is the real draw. You might think there would be a drifting away once the hoover’s turned off, but not at all. There follows a madly enthusiastic rummaging through the trays of leaf litter, moss and twig to find whatever is hiding beneath. The power of the whole exercise to grab attention, focus interest and actually inspire curiosity in the natural world is remarkable and tremendously encouraging. We will be hoovering the island, and further afield, for many years to come and that’s a promise! 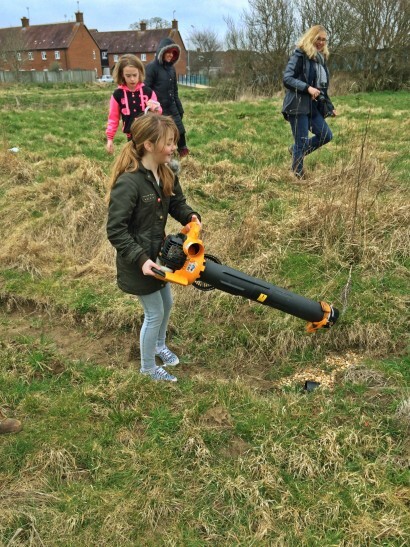 So engaging is the hoover experience that a mother whose family had a go at the 2014 Bioblitz tracked us down months later to ask if the hoover (and Ian) would come to her daughter’s 9th birthday party! We said yes of course.